bottom of the alien bldg. showing in background but Shuttle Craft not visible in foreground. Most of the Ailen buldings will only be seen by the camera. 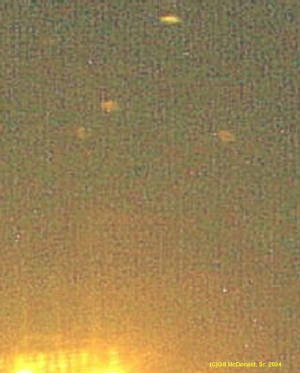 Before daybreak all of the Alien structures are no longer visible. The tree @ the left is at the top of the hill where the Alien Shuttle craft is docked. 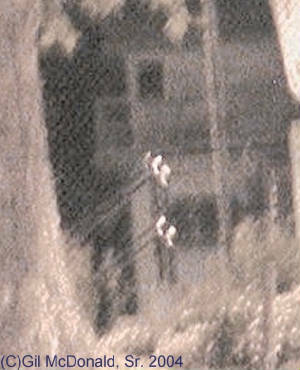 The building in the background is about 80 to 100 yards from the lens of a small, low cost digitital camera. This photo was taken at night using only available lighting. This building was only seen at this distance by the use of 10X binoculars. There are several human built buildings in the area. There is no human traffic in this area at night. The closest cyclone fence is ours (They sometime use this fence to hang cloaking material) but the Aliens have a very tall cyclone fence closer to and around their building. I could see thru it at the time I took the photo and some other times but I am guessing that they cover their cyclone fence with cloaking material to conceal their presence. 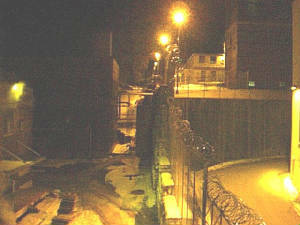 This building & fence dissapear before daybreak and are not there during the daytime. There is human traffic there in the daytime. I had to climb up several feet and look over the top of a hill (where the shuttle craft is parked) to see this building. There were some aliens moving around in the area and they looked like we would expect a ghost to look. 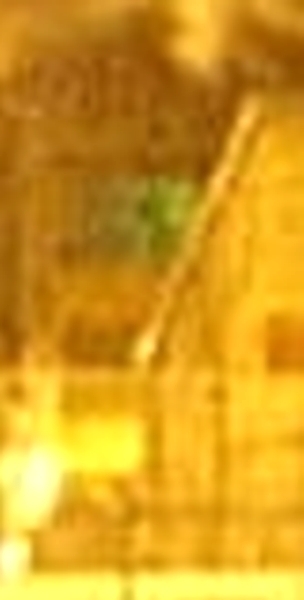 I could also see the roof (at a lower level) of another Alien building and some trees that were not our trees. From tower #10 I could look across the inside of the prison to the inside of the far prison wall and see heavy vine growth on the inside of the far wall but those vines belonged to the aliens. They could not be seen up close or in the daylight. Because of the angle, I couldn't get photos of those items. 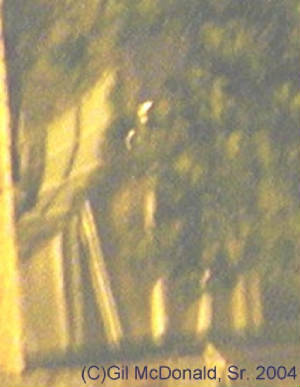 In some of the other photos you can see Alien framework that goes up around (our) lighted ground buildings. That framework supports their buildings above ours and gives them a surface on which to hang the cloaking material. I'm not sure where all of this goes in the daytime. Some speculate that this is another dimension, but I definately heard the shuttle craft give a loud 'thunk' when it docked up against our solid cement stairway. That indicates to me that it could not be happening in another dimension. *Almost invisible to the camera (@ 100 Yds.). 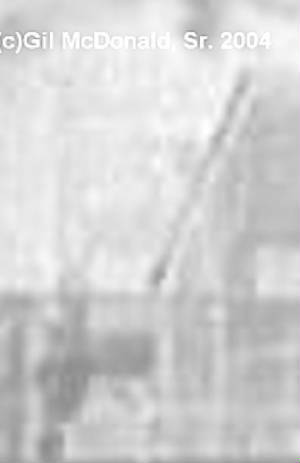 The photo above (HU#4) shows framework coming from the ground and going over the human built building (the rear of HU#4) to an area where there is some indication of alien buildings and operations. Apparently the aliens also use these framework structures to hang cloaking material. The curtains of cloaking material could be several layers thick and had to be replaced every four hours as they would seem to weaken and the alien images could be detected by human eyes. I believe these framework structures also go below ground into their underground operations area. as above. There is a cyclone fence (lower part of photo) between this building and the camera. 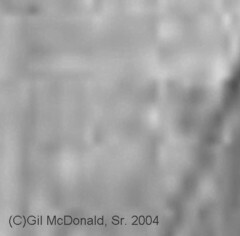 The grayscale photo above shows two Alien Gray heads. The Gray's heads are egg shaped with the dark round eyes and a dark round area where the mouth would be. These Grays appear to be holding a piece of Alien Equipment. The equipment looks like a small round barrel (about the size and shape of a horizontal small beer keg) with a slightly smaller round, thick disk at the end. The Alien equipment is located just above the copyright mark. I have on a couple of occasions seen a similar device located in different areas of the ABO. I have received few complaints of the difficulty in seeing any aliens in the above photos. They are usually extremely difficult to see under any circumstances. On one occasion at home I woke during the early morning hours (still dark outside) and saw a typical Gray standing near the foot of my bed. At that time I kept some dim lighting in the bedroom, livingroom, etc. The Gray was slightly more than three feet tall and had a piece of equipment on its right hand. The equipment was round, about eight inches in diameter and about three or four inches thick. It may have been used to control me (my guess is that they had just returned me from an examination) or it may have been a part of their survival equipment. My personal opinion is that the typical Gray is actually an alien inside of a space suit. When I saw the Gray near the foot of my bed I closed my eyes and pretended to sleep for a few seconds. I wanted to keep my eyelids slightly open to watch it but it appeared to be looking right at me and if it had seen me looking at it, it would have disappeared within a couple of seconds. I was taking the chance that it would stay around for a few seconds but when I opened my eyes again it was no longer visible. The photo above is a night time view of the ABO from tower #5, looking across the baseball field toward two gate on the left and industries on the right. In the photo below: THE VIEW FROM TEN GATE: Take note of the pile of wooden pallets located at the left center foreground. I have watched these pallets for hours as the top two would rotate to the left a quarter turn and then rotate back to the right a quarter turn as if someone or something was practicing their telekenetics technique. There was not even a slight breeze when this was taking place. The base of the cyclone fence that runs up to tower #10 is embedded into a limestone fence that comes up about three feet above ground level. The large stones in this fence probably weigh more than 80 lbs. One night I heard the sound of stone sliding against stone and looked at one stone moving very close to ten gate. The stone slid out of its position in the fence and floated softly to the ground. About three minutes later the large heavy stone lifted into the air and slid back into its place in the fence. From my point of view it looked as if it had not been disturbed. On another occasion as I looked to my right toward tower #11 in the quite of the early morning darkness I saw a large, heavy metal lid come off of a sewer line in that area and fly about thirty feet into the air as it flipped on a arch and went back to the ground. The only sounds were the scrapeing as it left its position in the sewer pipe and the loud klang as it hit the ground. The official explanation for that was a sewer gas explosion that blew the lid off. I was only fifty yards away and that was the first and only explosion that I never heard. 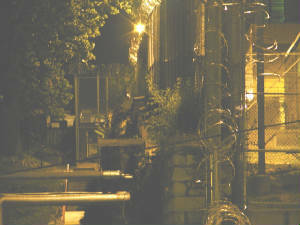 Another morning about 2 AM as I stood guard on tower #10 I looked to the area below the cement retaining wall, between the end of the shoe factory building and the fence that runs to tower ten. As I looked that direction I saw a small piece of scenery (2'H x 3'L) move upward from next to the ground. It was in the area of the paved road that curves around that end of the building and in front of the tall cement retaining wall. It looked like a tent corner was being lifted. When that cover was lifted I could see part of the left pants leg of what looked like a man's black trousers and a man's black shoe. All of this was in various shades of gray. Then the cover (tent corner) dropped and everything went back to looking normal. There was another time when the cement retaining wall had offered some unusual viewing opportunities. 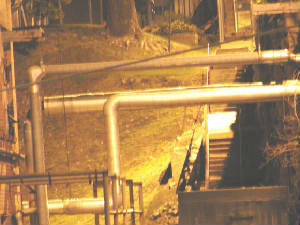 On one night when there was a hard rain I could see a bright yellow spot high on the retaining wall. I assumed it to be a reflection of one of the yard lights in the area until it began to look like there was a yellow light bulb in the background that was shining thru a window located high in the cement wall. Only, there was no window at that location. 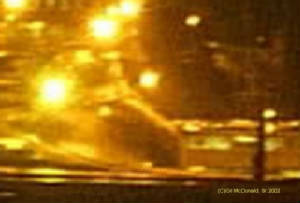 As I watched I saw a humanoid shadow approach the lighted window(?) from inside the cement wall and stand there a few seconds to look out at the rain. Then the shadow turned around and returned to the area within the wall. When the rain ended there was no indication that there was any window at that location. ...fence. The camera could not see thru the covering, but I could only see thru it.